Remember that, residents of snowy Boston in January, rainy Houston in November, frigid New York in February, and hurricane-threatened Florida any time in the fall. Many parts of the country are lucky to get four months a year of good weather. That the weather takes a sharp turn for the better on Labor Day seems to be a profound article of faith among Las Vegans (honest, that’s what they call themselves, maybe because Vegasites sounds too much like Sodomites). In the past two weeks I’ve had any number of people I encountered reference Labor Day with the kind of reverence the rest of us reserve for special times like Thanksgiving and Super Bowl Sunday. 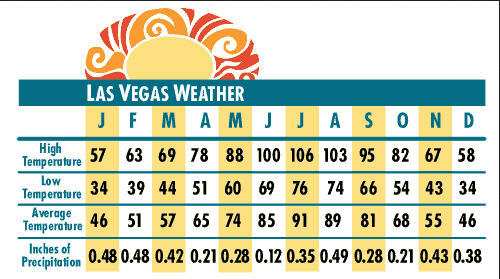 At this time of the year it seems like everyone in Las Vegas is a meteorologist predicting the weather. Now, all the jokes you hear ending in, “Yeah, but it’s a dry heat” do cause grimaces here. One hundred degrees-plus is oppressive whether or not you are well-hydrated and wearing a hat. The ground is even too hot for dogs to walk on by 11 am, although pet shops do sell dog boots. Thanks to the home A/C, in both July and August I paid more to the electric utility (owned, as it happens, by Warren Buffett’s Berkshire Hathaway) than I did for an entire year in Seattle. But time is clearly on my side. Keep watching my weather box.